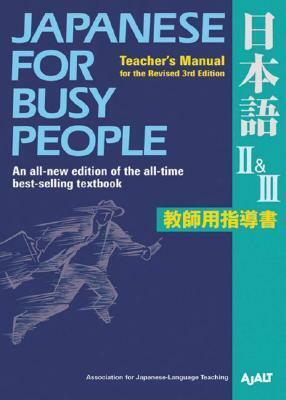 The Teachers Manual gives tips for using Japanese for Busy People II & III in a classroom setting, as well as advice on how to teach difficult areas of grammar. In addition, the book provides translations of all introductions, grammatical explanations, notes, and instructions appearing in Japanese for Busy People II & III. AJALT was recognized as a nonprofit organization by Japan’s Ministry of Education in 1977. It was established to meet the needs of people who wish to communicate effectively in Japanese. In 1992 AJALT was awarded the Japan Foundation Special Prize. They are the authors of the Japanese for Young People series and Japanese for Professionals.